I've been seeing those adorable feltie PB and J hair clips all over the place and I thought that they would look just as cute crocheted. I was right! These make perfect best friend gifts, but I wouldn't mind just wearing them both myself. 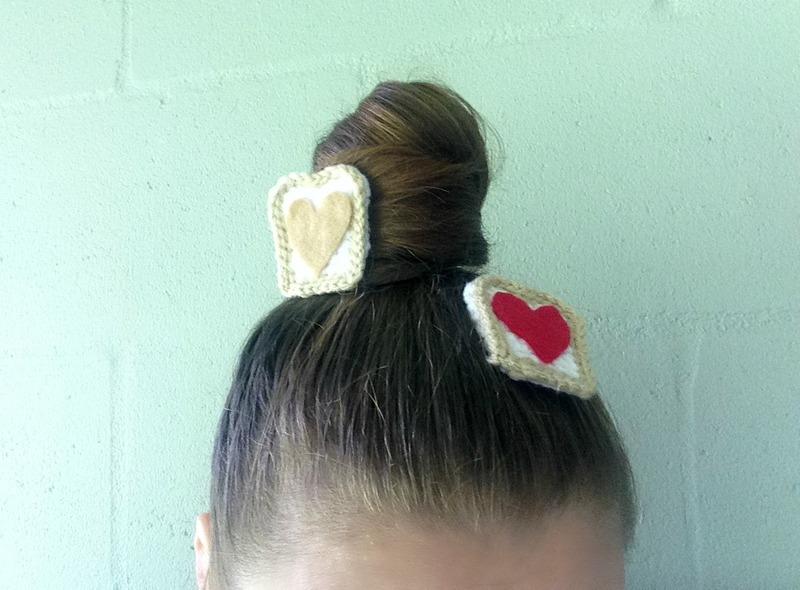 I did use felt for the peanut butter and jelly. 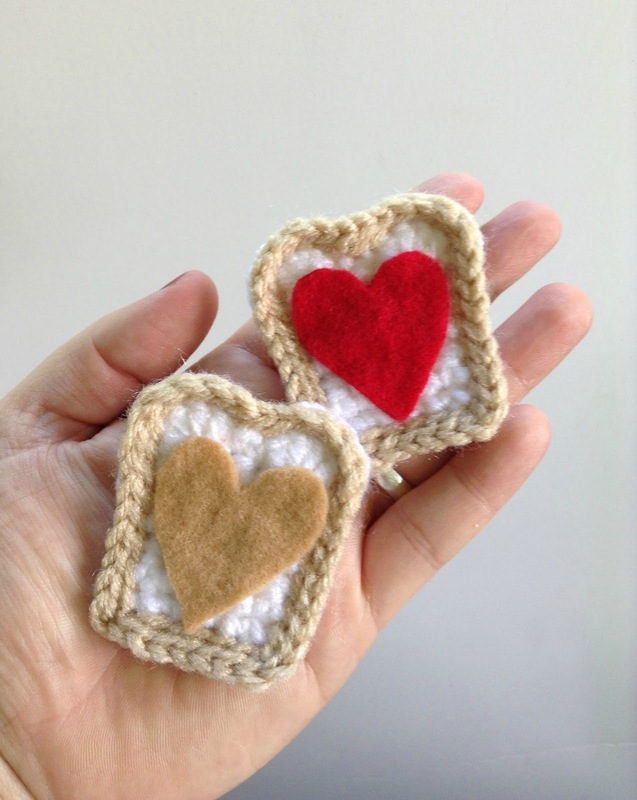 It was easier to get the blobs of peanut butter and jelly into the shapes I wanted with the felt than if I had just crocheted them. 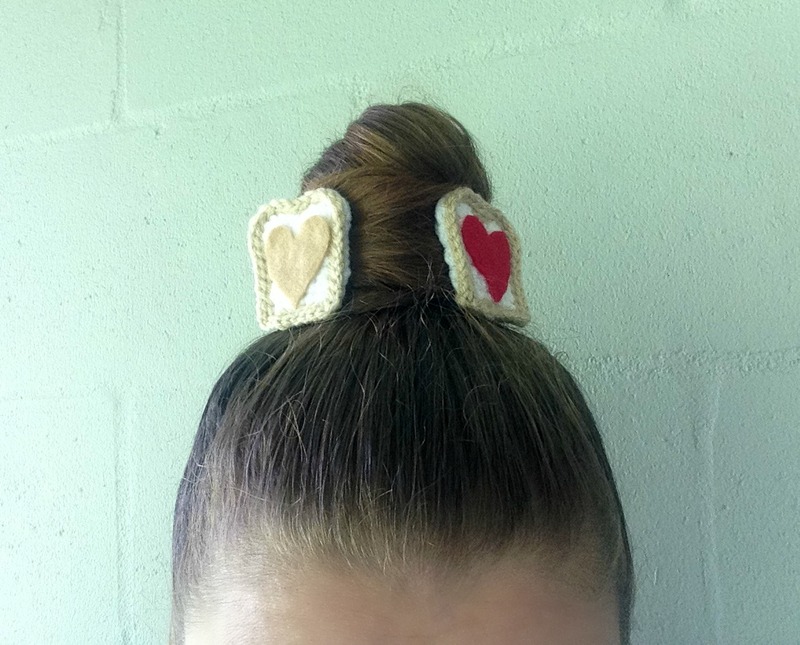 I've also been using felt details on some of my hair accessories as a way to cut down on production time and thus cut down on costs for my customers. This pattern is super simple and super fast to work up! You'll have adorable hair clips in no time! R7- Chain 1. 4 DC in next stitch. Slip stitch in next 2. Chain 1. 4 DC in next stitch. Slip stitch in last stitch. Finish off. Switch to your light brown color. Join in the bottom left corner of the bread. Slip stitch around the slice of bread. In each bottom corner put one slip stitch, chain 1, then another slip stitch. When you come to your first slip stitch of the round continue to put one slip stitch in the back loops of the previous round of slip stitches. Finish off. I glue on peanut butter and jelly in heart or blob shapes. Then, I put a dot of hot glue on the back of the bread and glue all my ends down. It is much easier and neater (for me) than trying to weave them in. If I can find a way to avoid weaving in ends you bet I'm going to do just that! Cut a piece of white felt slightly smaller than the back of your bread and hot glue it on to further secure your ends and make your piece sturdy. 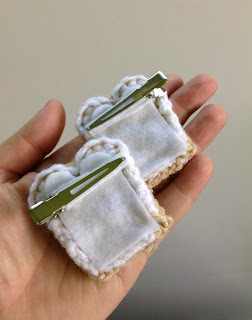 Then, glue on your alligator clip (I also hot glue some felt onto my alligator clips.). Here is what the back of my clips look like. And here I am being silly with the clips. I like to get some quirky shots in and show them in action. As always please feel free to sell anything you make from my patterns, but do not sell, alter, or distribute this pattern as your own. If you wish to share the pattern itself you must link back to this blog post- no copying and pasting. Please use your own images- you may not use my images to sell anything.